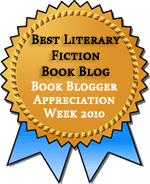 Jenny’s review this week of Under the Dome, Clare’s review of Misery last week, my own recent reading of Four Past Midnight, and the many lists of scary books I’ve been seeing for the RIP Challenge all conspired this week to put me in a Stephen King mood. Misery has been hanging around on my shelves for several years, so I decided to finally dust it off and give it a read. Now I mostly want to crawl into a corner and whimper for a while. As many of you know, I’m a Stephen King fan—perhaps not quite the fan Jenny is, but a fan just the same. Well, even as a fan, I was astonished by how intense Misery was. I had seen the movie several years ago, so I knew the basic plot, but King’s writing tore into me. It’s been quite a while since a book elicited such a visceral reaction from me. I shrieked and squirmed and nearly put the book in the freezer. It’s that upsetting. In several comment threads and Twitter discussions about King recently, I’ve seen folks say that Misery scared them away from King. Well, let me tell you, this was probably the scariest and most gruesome King book I’ve read. I think it’s because in this case, the horror does not come from a supernatural event or some other extreme and unlikely scenario; instead, it all comes from a single psychotic woman. It felt all too real. I suspect most of you know the plot, so I’ll be brief. Paul Sheldon, a writer best known for a popular series of bodice rippers about a woman named Misery, wakes up after a car crash to find himself in the home of Annie Wilkes, his self-proclaimed number one fan. It doesn’t take long for Paul to figure out that being saved by an enthusiastic fan like Annie is no salvation at all. Annie, you see, is completely insane. And now Paul is in her care—and in her clutches. She is the one who brings him food and water and the pain pills he has become addicted to. And when he is a “dirty bird,” she brings his punishment. One of the things that struck me immediately about this book is how well it shows off King’s virtuosic writing skills. Like Jenny, I consider King a master at dialogue—one of the best dialogue writers I’ve ever encountered, in fact. But I also tend to think of him as a straightforward writer, one who doesn’t play with language and form. That’s not to minimize the extreme skill required in telling a story straightforwardly; it’s harder than some would give writers like King credit for. However, linguistic play and experimentation is not something I look for in a King novel, which makes it all the more stunning when I find it. When he came back to his former state of semiconsciousness, he was able to make the connection between the piling and his current situation—it seemed to float into his hand. The pain wasn’t tidal. That was the lesson of the dream which was really a memory. The pain only appeared to come and go. The pain was like the piling, sometimes covered and sometimes visible, but always there. When the pain wasn’t harrying him through the deep stone grayness of his cloud, he was dumbly grateful, but he was no longer fooled—it was still there, waiting to return. And there was not just one piling but two; the pain was the pilings, and part of him knew for a long time before most of his mind had knowledge of knowing that the shattered pilings were his own shattered legs. Throughout the book, King plays with images of Annie as a goddess from an H. Rider Haggard novel, of Paul as a captive African bird or as Scheherazade. There are some brilliant passages about the power of story, of “the gotta” that keeps a reader always hungry for another fix, another chapter in the tale. And then there’s the story within the story, the Misery novel that Paul writes for Annie. It feels exactly right. This is King at the height of his powers. Of course, as I’ve suggested above, this book is not for the squeamish. If you’ve seen the movie, you still haven’t seen how far King will go. However, I will say one thing you can generally (but not always) rely on when it comes to a Stephen King novel. It’s the thing that always makes me push through to the end (and it’s ever so slightly spoilery, so be warned). Paul Sheldon thinks of his new Misery novel as an elaborate game of “Can you?” in which someone sets up a story with an impossible situation and another player has to figure out a way to resolve it. King’s novels are frequently big games of “Can you?” and he almost always can—not always cleanly, sometimes through cheating, and often with dreadful losses along the way—but there is a way out, if you can bear the journey. Do you dare try it? 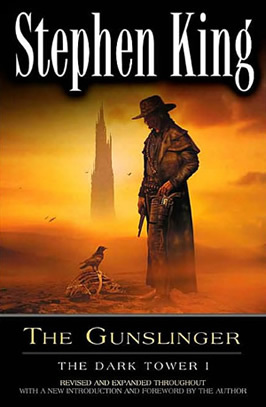 A related note: I’ve been craving a reread of what I consider King’s greatest achievement, the seven Dark Tower books, and Jenny and I have been toying with the idea of a readalong at the start of 2011. There is some talk of a movie/TV series directed by Ron Howard, with filming to begin in 2011. If you’ve been thinking of reading the series, this may be a good time, before the movie images are indelibly fixed in your mind. I agree that Misery can be rather upsetting. There were times while reading it that I had just to put the book down, until my breathing went back to normal. I had to put it down several times to pull myself together. That’s unusual for me, even with Stephen King! 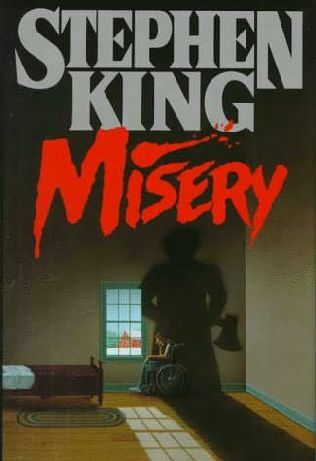 I love Stephen King and while Misery isn’t one of my favorites, I did enjoy it. I have yet to read any of the Dark Tower series so would be game to participate in the readalong. I absolutely loved the writing in this one, but I don’t think it’s one I’ll return to. It was almost too much! And I’d love for you to join the readalong. I haven’t read any of the Dark Tower saga so I would totally up for that. Readalongs are so much fun. I think you would love the Dark Tower books. Seems like your kind of thing. My husband has all the Dark Tower books on CD and just finsihed listening to the final disc earlier this week. He is a bit bereft about it at the moment as I do believe it is one of his favorite series of books. The audio version of Dark Tower series is wonderful. I listened to most of them a few years ago just before the last book was published. I’ve always maintained that the scariest stories are not the ones with supernatural elements, but the ones where I could actually see the events depicted playing out in real life. This is why I maintain that The Shining (another King classic!) is one of the scariest movies of all time. Tony disagrees, but I think he’s just plain wrong on that one. I’ve actually never seen this film (or read the book as I’ve not read any King), but I’m thinking that maybe I should just so that I can finally say that I’ve read something by him! The topic certainly appeals in a very twisted way! Oh so the audio version of Dark Tower are good, are they? That may be the direction I go, & would be interested to listen along during the readalong! (My partner & I have lots of crafting & programming time during which we listen to audiobooks.) Thanks for the tip! As for Misery, yikes, you really took the RIP plunge! I think I’ll be holding off on this one for a good long time, although I was intrigued by the review of Under the Dome. I grew up with Stephen King, his mass market paperbacks strewn around the house. I remember that the copy of Misery the read had, as an inside flap, photo of Misery Chastain and Stephen King in one of those old skool romance bodice-rippers covers, haha. I’m with you on wanting matched sets. Alas, my Dark Tower books don’t all match because they apparently redesigned the spines when the final three books came out. Oh well, at least they’re all the same size.